On October 8th, 2018 our 18' TrailerMade trailer arrived from distributor Maverick Tiny Homes located here in TIpp City, Ohio. 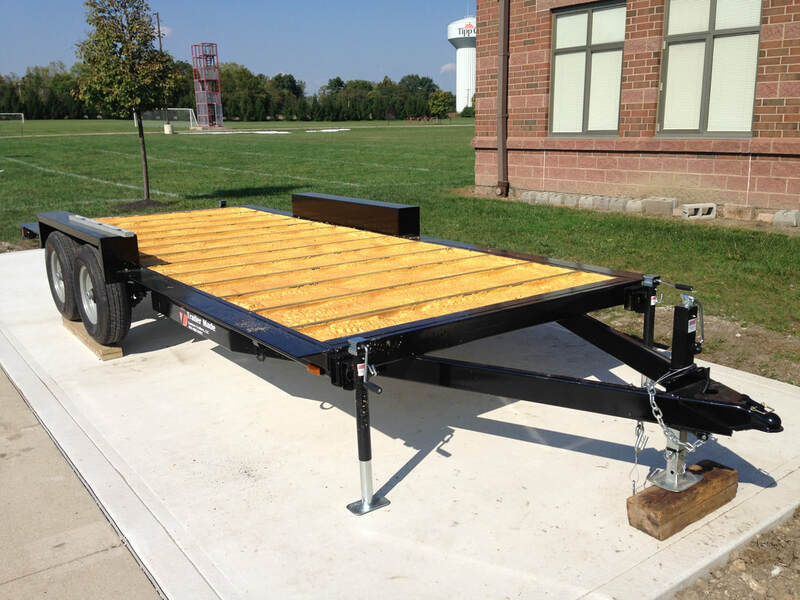 The trailer is rated at 12,000 lbs with four corner jacks. It includes 2 tandem 6K Axles (12k capacity), Galvanized Belly Pan, and 16" o.c. steel cross members. Over the next couple of months the fall Homebuilding I and Homebuiling II classes will be working on the house along with micro houses which will be donated to Veteran's Ananda, an organization in New York that provides free, world class, medical, psychological, and spiritual care to U.S. Armed Service Members, veterans, first responders, and their families. ​Once completed we will sell a "Tipp Tiny House" each year and use the proceeds to fund the program. The program will continue to provide our students the opportunity to learn hands-on construction skills that are in dire need, engineering and problem solving skills, environmental awareness, the need for affordable and sustainable housing, the impact of giving back to the community, and many more important life skills. Tipp City Exempted Village Schools and its local community are committed to educational excellence and proud of its students' achievements in academics, athletics, and service to others. Strong community support, involved parents, and dedicated, highly qualified educators are the pillars to our success. Located 15 miles north of Dayton just off I-75 in the heartland of America, Tipp City is was recently voted one of the Five Best Hometowns in Ohio, Tipp City exudes Midwestern friendliness and small-town charm.